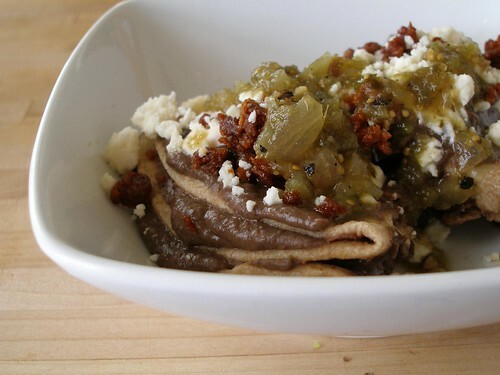 Ever since Jeff found Rick Bayless' recipe for enfrijoladas, it's become a staple around our house. 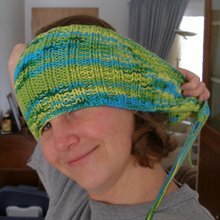 While it isn't particularly quick, it is incredibly easy. The amount of actual effort required on my part is so small that I make it pretty often. Really, it takes like 3 minutes to get everything in the pot. It's also yummy and the perfect comfort food, especially since it's full of protein and fiber instead of processed starches. It's also one of two recipes that Sean (our oldest- 19) asked how to make on a recent visit home, which I feel is a ringing endorsement. If you've got a pressure cooker, you can do these in less than an hour. If not, you could cook them in a slow cooker all day. 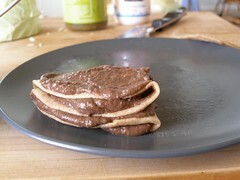 Obviously, you can also do these on the stove top for several hours, but you'll have to plan your day accordingly. My pressure cooker is one of my best friends in the kitchen. It makes it super easy to cook dried beans, which are healthy, healthy, healthy and cheap, cheap, cheap. I usually make a big batch because this works really well as left-overs (you may need to stir in a bit of water because it tends to thicken in the fridge). Feel free to halve the recipe below. 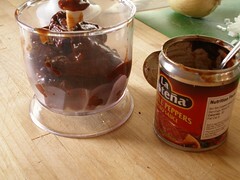 Before we get started, I should give a bit of an explanation about one of the ingredients, the chipotles in adobo sauce. #1- I love these things. I've used them in just about every type of tomato based recipe I've ever tried, from spaghetti sauce to chili. At first I was intimidated by them, but now I always have them in my kitchen. #2- Although they come in a little can, you will never use all of it at once. What I do is puree the entire thing with my immersion blender attachment and then freeze it in individual ice cube shapes. 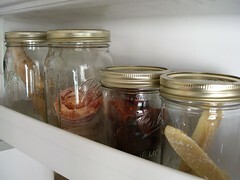 All of those get stored in a mason jar in the freezer. As a substitution, I use about one cube per chili in a recipe. -Check the beans for stones or other debris (depending on your source, you may or may not need to do this every time), rinse them under running water and dump them in the pot. 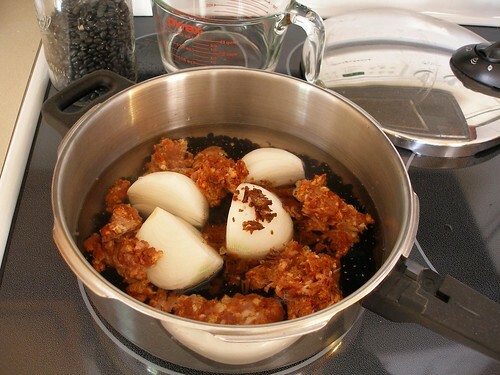 -Add the water, onions, chipotles and HALF of the chorizo. -What you should see is a really loose mixture of beans and water, with the water just covering the beans. If there's too much water, pull some out (but don't toss it just yet, you may need to add it back). -Here is where I use the immersion blender to blend it til it's smooth. But if you don't have one, you can puree it in a blender (with lid loosely covered and a dishtowel for protection) or a food processor. -Add salt to taste and, if necessary, thin it with water till it's the consistency of a cream soup. -Fry up the other half of the chorizo. I like it cooked til it's almost crispy. 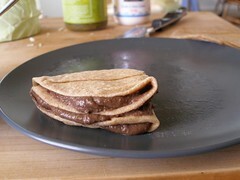 -Microwave the tortillas a few seconds till they're warm and pliable. 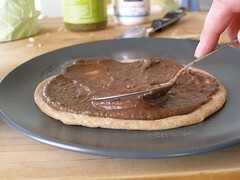 -Place one of them on a plate, spread some of the bean mixture over the top. 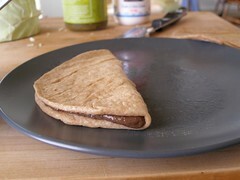 Then fold the tortilla in half and spread more beans on top. Fold over on itself again one last time and spread on more beans. -To serve, top with the chorizo, cheese and salsa. Sour cream's good with these too. When I made this yesterday, I cooked up some Mexican-spiced cabbage to go on the side. It turned out really tasty and Joey even had a snack of the cabbage rolled up in a tortilla. Yes, my 11 year old ate cabbage rolled into a tortilla. It was that good. Let me know if any of you are interested in a recipe for that. *If using a pressure cooker, just put on the lid, bring to pressure and adjust temp... takes about an hour. If using a crock pot, you'll probably want to first bring the beans and 6 or 7 cups water to a boil in a pot and then dump those, along with the rest of the ingredients, into the cooker... should take about 6 hours, but you can overcook these if you need to leave it up to 10 hours. For the stove top, it'll take 2 to 3 hours... just keep adding more water if it's getting dry. Mmmmmm - I cook my beans in the slow-cooker all the time and my kids devour them! I just might try this recipe - which is a a bit different from what I usually do. I'd love to see the recipe for the Mexican cabbage! Sounds good to me! Kay, I can try this. 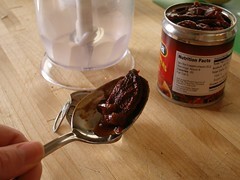 I like anything even remotely Mexican in flavor, and I do love those chiles in adobo sauce. Got them in my cupboard right now, dontchaknow. I do. They're going into pulled pork tacos this week. 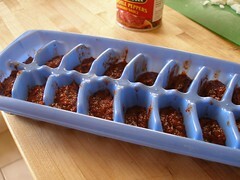 Thanks for the recco on freezing them into pureed cubes - great idea! Yum - I think I need to try this. We're in love with chilies in adobo sauce right now. I made awesome salsa with it. Yummy! You'll have to fix some for us next time we're there! Or ship it overnight? 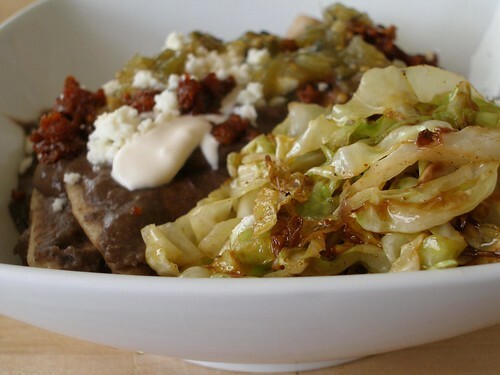 Would love the cabbage recipe - I love cooked cabbage (but hate sauerkraut). FYI, did you know that the red bean up top has a face? Thanks for the tip on the chipotles, I'm totally trying them out in my next spicy recipe. Um, Yum! And I love your photos... I'm actually drooling just a bit. 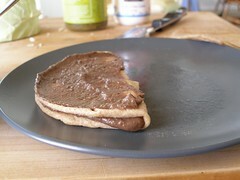 I linked to this today on Foodwhirl!